Canada Buys Controversial Oil Pipeline, Ensures Its Expansion : The Two-Way This is a key part of Canada's effort to boost oil exports to Asian markets — but the plan has been protested by indigenous groups and environmental activists. Oil tanks stand near the Trans Mountain pipeline expansion site in Burnaby, British Columbia, in April. The Canadian government bought the project in an effort to ensure it goes forward as the summer construction season nears. Canadian Prime Minister Justin Trudeau says that the expansion of the Trans Mountain pipeline is "a vital project in the national interest" and that its purchase will ensure the expansion is built, despite protests from environmentalists and other groups. Canada will control both the 715-mile pipeline and its expansion, which is meant to increase capacity to 890,000 barrels a day. To do so, Canada will pay the pipeline's current owner, Kinder Morgan, $4.5 billion in Canadian dollars — about $3.5 billion in U.S. currency. "Today, we've taken action to create & protect jobs in Alberta and BC, and restart construction on the TMX pipeline expansion, a vital project in the national interest," Trudeau said in a tweet. 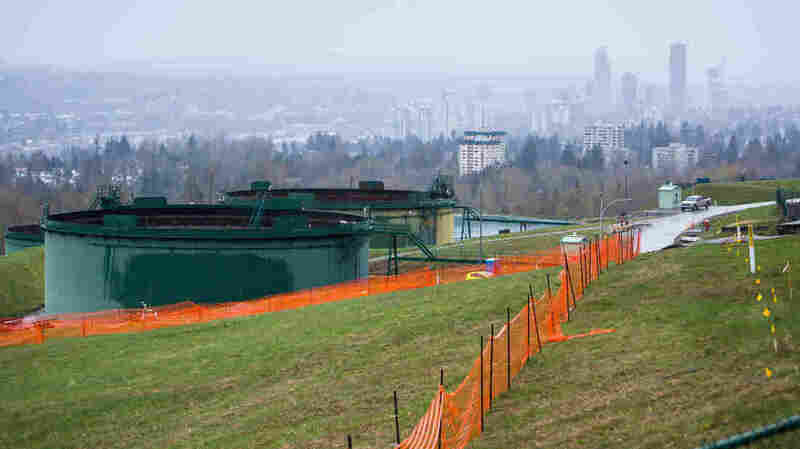 The pipeline connects oil sands facilities near Edmonton, Alberta, to tanks in Burnaby, near Vancouver on Canada's west coast. Its expansion is a key part of Canada's effort to boost oil exports to Asian markets — but the plan has been protested by indigenous groups and environmental activists, who warn of the risks of a spill and the hazards of increased petroleum tanker traffic. Discussing the plan on Tuesday, Finance Minister Bill Morneau said the government acted to remove political uncertainty and ensure the project goes forward as the summer construction season nears. The issue has divided two Canadian provinces, pitting Alberta's government against leaders in British Columbia. Their reactions Tuesday were decidedly different. "Any climate change plan that ignores the needs of working people is doomed to fail," Alberta Premier Rachel Notley said after the deal was announced. "And any economic plan that ignores climate change is setting our businesses, our kids and future generations up to fail." In British Columbia, Premier John Horgan said, "Tens of thousands of B.C. jobs depend on pristine coastal and inland waters. Our environment generates millions in economic activity, from tourism to film and fisheries. It does not matter who owns the pipeline. What matters is defending our coast — and our lands, rivers and streams — from the impact of a dilbit [diluted bitumen] spill." Horgan said his province will continue to seek a legal remedy to stop the expansion. The pipeline purchase is expected to close in August. It is subject to approval by Kinder Morgan's shareholders. In addition to the initial costs of paying to nationalize a massive energy enterprise, the Canadian Broadcasting Corp. reports that the government could be obliged to spend billions more to finish the expansion. After it completes the project, Canada plans to sell the pipeline. To help attract a future buyer for the pipeline, Morneau said, the government plans to "extend the federal indemnity to protect any new owner from costs associated with politically motivated delays." NPR's Jeff Brady contributed to this report.